Home › Press and Insight › Do we really need competencies when it comes to interviewing? Many managers believe themselves to be good judges of character. However, most human resources professionals as well as business schools researchers accept that the traditional interview is a poor method for selecting the best candidates. We know this because of research looking at the predictive validity of different interview methods. Predictive validity is the correlation coefficient between (a) the scores that candidates are given when they are hired and (b) their performance at some later date in time. A predictive validity of 1.0 would mean that the scores given to a candidate perfectly predict their later performance. A predictive validity of 0 means that there is no relationship between scores and their later performance. While it’s possible in the physical sciences and chemistry to predict what will always happen when, for example, you add a certain amount of sodium to water, that’s simply not possible with people. So even the very best assessment centres have predictive validities of no more than 0.6. Recent research published in the Journal of Occupational and Organizational Psychology looked at the different types of interview that we can put candidates through. 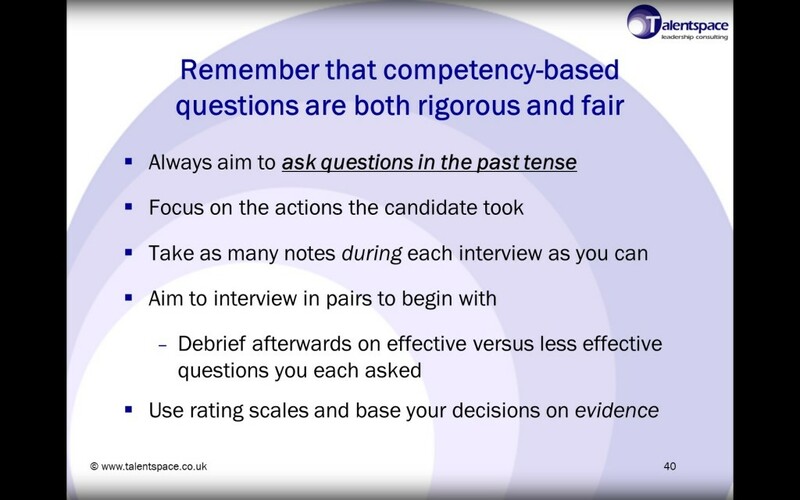 The slide below (from a Talentspace training workshop on effective selection interviewing) shows the predictive validities of different interview methods. 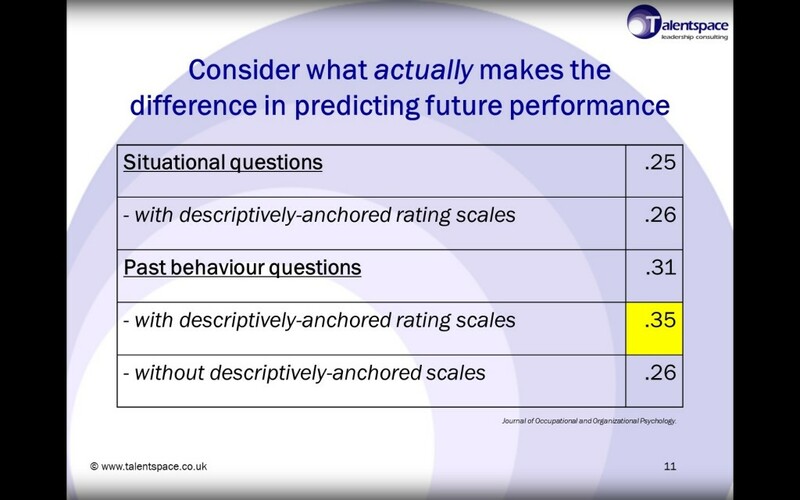 As you can see from the table above, there’s no difference in the ability of these two question types to predict future performance. It’s only when you also have descriptively-anchored rating scales that you get the improvement in predictive validity. And you can only have descriptively-anchored rating scales when your organisation has its own set of competencies (also known as capabilities) describing what good behaviour looks like.